James Gilbert is a Board certified Civil Trial Attorney (National Board of Trial Advocacy) and Fellow of the American College of Trial Attorneys. He earned a bachelor’s degree from Eastern Kentucky University in 1969, and after a hitch in the United States Army, received his Juris Doctor (J.D.) degree from the University of Kentucky College of Law in 1974, and a master of laws (LL.M) degree from the University of Illinois in 1975. He was licensed to practice law in Kentucky in 1974, and has been admitted to practice in the United States District Court of Eastern District of Kentucky, the United States Sixth Circuit Court of Appeals, and the United States Supreme Court. 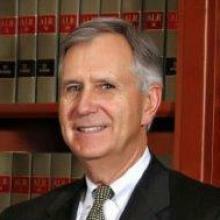 Mr. Gilbert has been in private practice in Madison County, Kentucky, from 1975 to the present; served as the Corporation Counsel for the City of Berea, Kentucky from 1976 through 2013, was an assistant prosecutor (part time) from 1978 to 1980; and has twice been a Special Justice on the Kentucky Supreme Court (1989-90; 1995). He is a member of many professional associations, including the American Association for Justice (member of the Sections on Motor Vehicle and Premises Liability, and Insurance), the Kentucky Association for Justice (Past President 2011), the Kentucky and Madison County Bar Associations, Kentucky Municipal Lawyers Association, and the Kentucky Bank Counsel Association. Mr. Gilbert received the prestigious Peter Perlman Outstanding Kentucky Trial Lawyer in September, 2012. He is very active in his community, serving on the Eastern Kentucky University Board of Regents (1988-2006; Chair 1989-2001), the Board of Directors, Berea Hospital (1982-1994) Board of Directors, Boy Scouts of America, Bluegrass Council (1990-1993), and the Board of Directors, United Way of Madison County (1988-2001. He attends the First Christian Church, Berea, Kentucky, where he is an Elder and Member of the Board. His civic organizations include the Berea Chamber of Commerce, American Legion Post No. 50, the Kingston Masonic Lodge No. 315, Madison County and Kentucky Historical Societies, the Society of Boonesborough, and the Madison County Civil War Round Table. He is currently a director of Peoples Bank and Trust Company of Madison County, serving as chair of the audit committee. He has written extensively on legal topics, and is a frequent teacher of other attorneys on personal injury and trial related issues. Mr. Gilbert takes advantage of many seminars and learning opportunities every year, and is not only a Board Certified Civil Trial Attorney, he is recognized by the National College of Advocacy at the Advocate level and is currently working on his recognition as a Fellow by the college, which requires 200 credit hours of approved continuing legal education at the national level. His areas of Practice include: Car, Truck, Motorcycle collisions; Wrongful Death; Insurance Claims; Unsafe Premises; Defective Products; Commercial Litigation; and General Civil Litigation. Approximately 85% of his practice is devoted to Litigation.